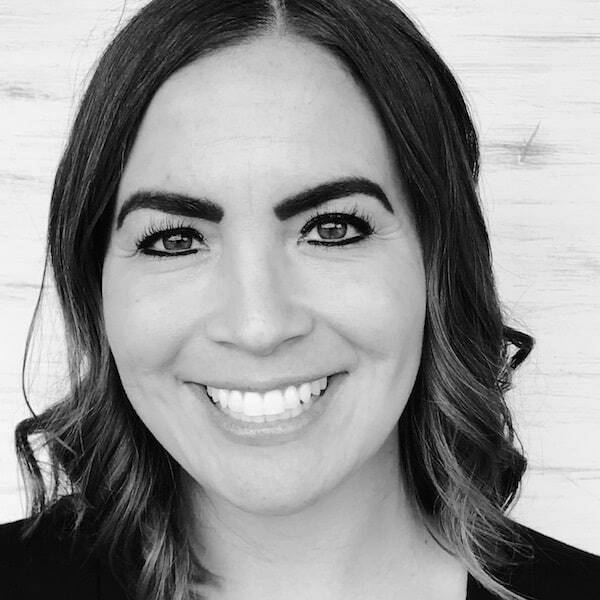 Hi, it’s Jenn, from Eat Cake For Dinner. Are you enjoying the holidays? I’ve been shopping so much lately, trying to get all my gifts purchased, so I can just relax and enjoy December. I’m about halfway done and I’m thinking about buying gift cards for everyone else. Do you like to get gift cards or would you rather have an actual gift? When did kid’s toys get so expensive? Something you would think should be under $20 is more like $50. It’s crazy. After a long day of shopping, this bread is well deserved and I am currently obsessed with it. The first time I tried this bread was the first time using maraschino cherries and I am now a huge fan. 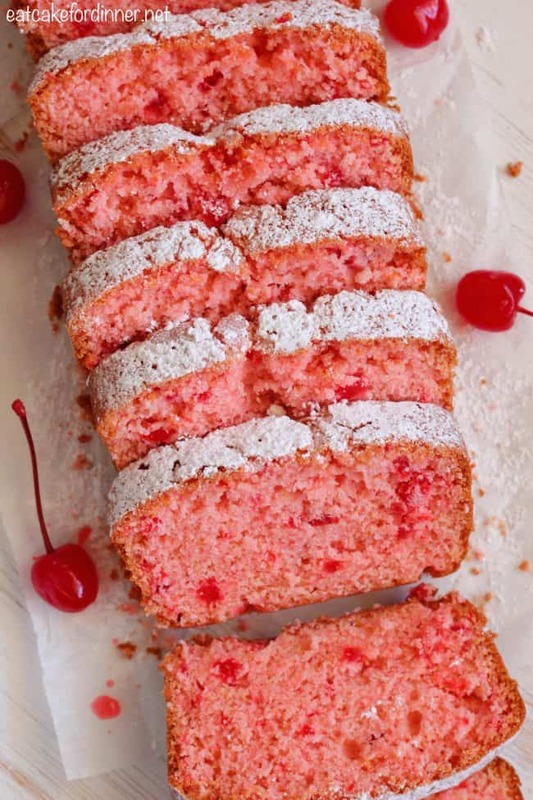 They are sweet and the flavor is similar to almond flavoring, so by adding almond extract to this recipe, it enhances the maraschino cherry flavor. I have now made this bread several times and I can’t get enough. The only thing is, you will want to use 8×4-inch loaf pans. That is a little smaller than a standard-size loaf pan. I have tried this recipe using a standard-size, but the loaves were really flat, still tasted great, just not as pretty. 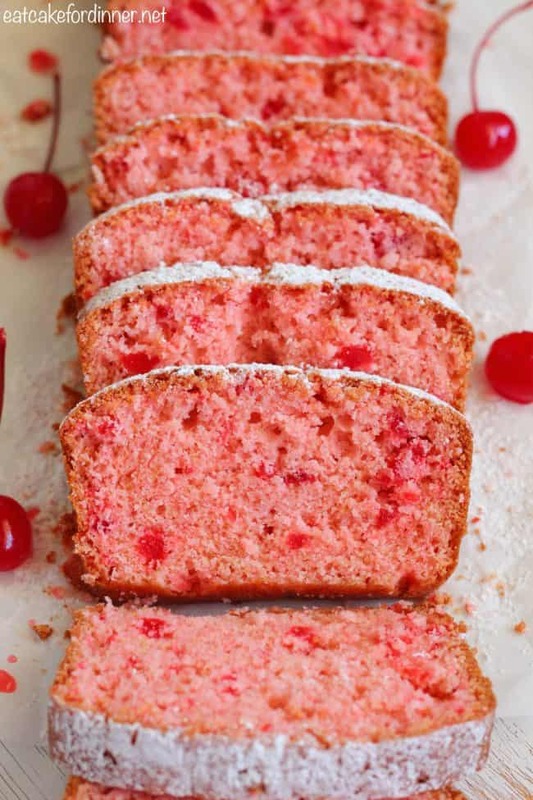 This bread has a great soft texture and a sweet almond flavor with bits of cherries throughout. This beautiful bread would be a perfect neighbor gift. Wrap it up in some pretty cellophane and a pretty ribbon and your neighbors will love you. You know they will already have plates of cookies and candy from neighbors, so bread will be a nice welcoming change. 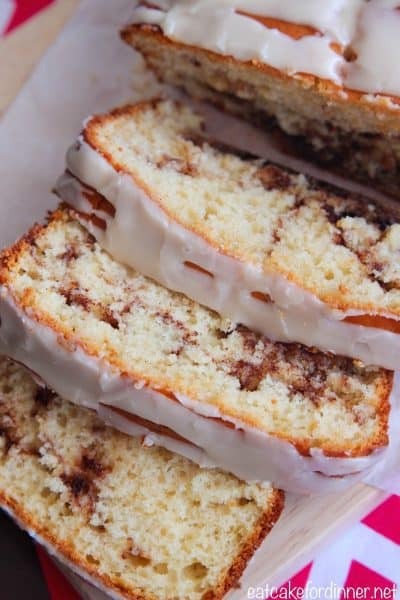 Someone gave me a loaf of cinnamon swirl bread last year and I preferred that over all the other candy. 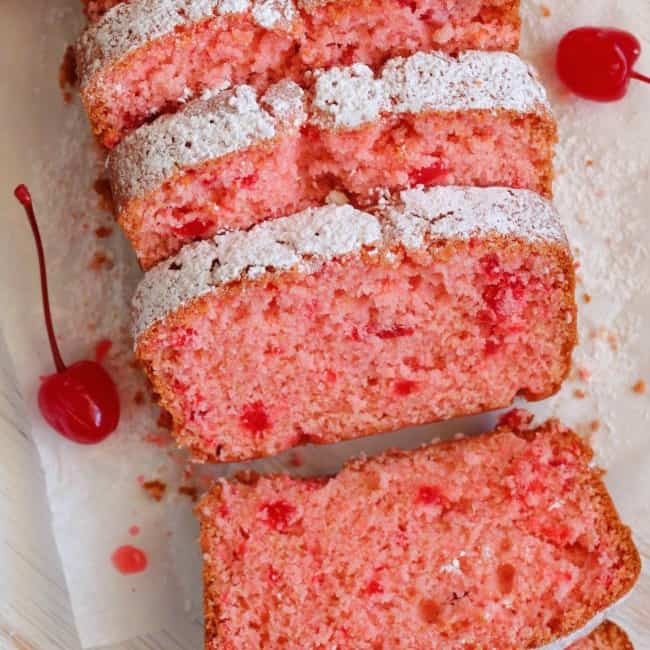 A delicious quick bread with a soft texture and a sweet almond flavor with bits of cherries throughout. Preheat oven to 325 degrees. Grease and flour (or line with parchment paper) two 8x4-inch loaf pans; set aside. In a large mixing bowl, cream sugar and oil; add eggs, vanilla and almond extract and beat well. 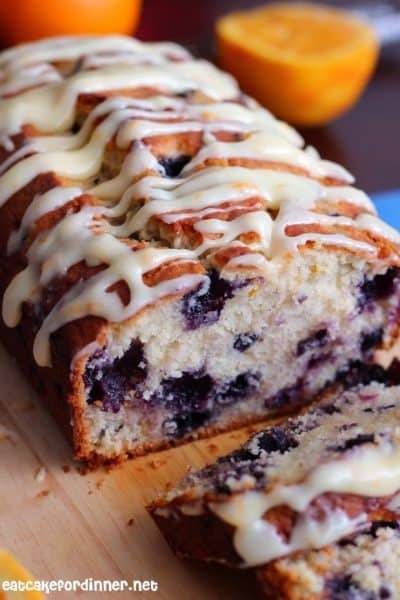 In a separate bowl, whisk together flour and baking powder. Measure out ½ cup of the reserved maraschino cherry juice. If juice does not equal ½ cup, add enough water to make up the rest. 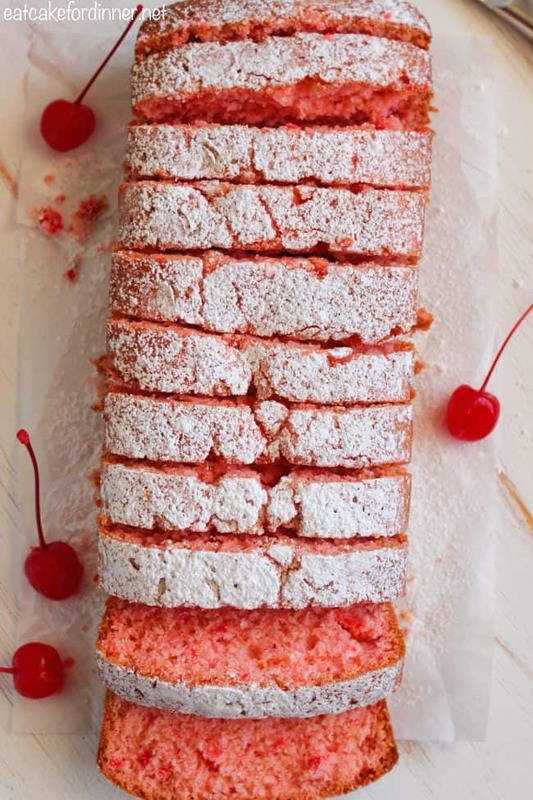 Alternately add the flour mixture and cherry juice to the sugar mixture until it is just combined. Stir in the chopped cherries. Divide batter evenly between both loaf pans. Bake for about 45 minutes or until a toothpick inserted in the center comes out clean. Remove from oven and cool in pan for 10 minutes, then invert to a wire rack and cool completely. Dust tops of bread with powdered sugar, if desired, slice and serve. Makes: 2 loaves. You can see upcoming themes in one of the pages at the top of my home page. If you would like to join in the fun please schedule a reminder for each week. I was looking for a Valentine’s Day sweet treat to give to a friend, so I decided to make this recipe. It was so good! 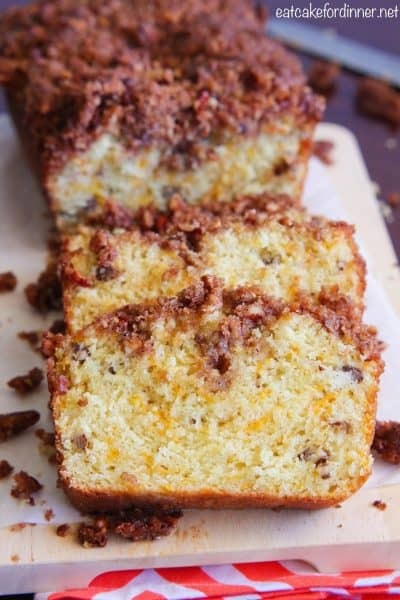 I ended up combining it into one loaf pan and cooking it longer – it turned out really moist and delicious! Thanks for the great recipe! The flavor here is delicious, it’s just too sweet. I would do less sugar next time, probably half the sugar at that. Also, used a regular bread pan and cooked for 60 mins. 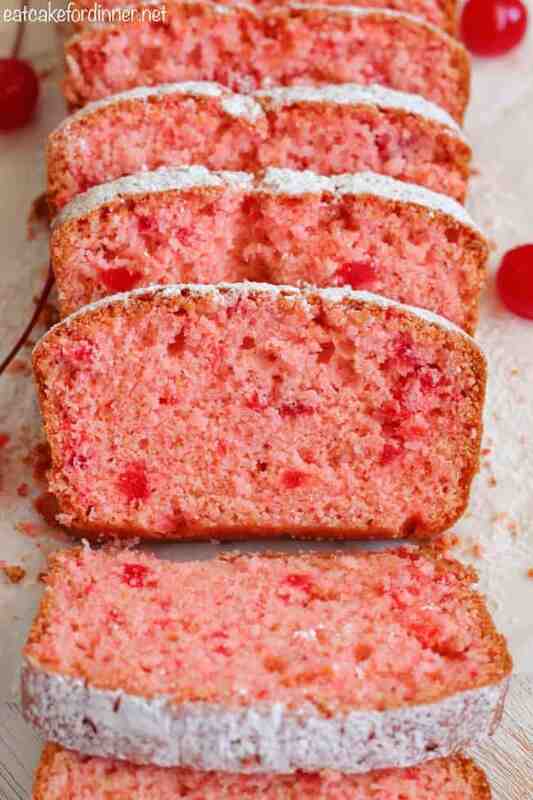 I really want to make this cherry almond bread, but I want to make mini loaves. Can you tell me if there is a different temperature or bake time needed?